Now that we’ve covered the minor stuff, we’ve finally come to what can only be considered; --- The ELEPHANT IN THE ROOM --- INDUSTRIAL HEMP growth within the state of Oklahoma. To which. . . if all the rosy projections are true, . . and if all the planets align themselves properly, . . and if purple rain begins to fall, . . . and if, . . etc., can contribute as much as $200,000,000 dollars per year, in direct additional tax revenues to our states coffers. Not to mention billions to our state economy, which in turn (more money means more spending) leads to increase sales tax revenues, etc. How’s that possible? Let’s do a little “wishful thinking math.” Although agriculture is an over $7 Billion dollar a year industry here in Oklahoma, the bulk of that is in ranching. With crop growth, including everything from wheat to alfalfa accounting for only about a third or $2 Billion of that figure. And as half of all farm income is taken up by expenses (meaning it’s tax deductible), crop farmers therefore are paying taxes on only half or $1-Billion dollars of that. Now, again using wishful thinking, if ALL crop farmers switched to Industrial Hemp AND if the reports of farmers who have switched to hemp and are now racking in three-times as much for their crop ARE TRUE. Then some quick math shows that these farmers will now be paying EXTRA taxes (in excess of what they were paying before) on some $4 Billion dollars in excess earnings. Which, assuming the farmers actually paid 5% of those earnings as taxes, equals some $200 Million dollars in additional tax revenues to the state. HOWEVER, what if we did NOT use wishful thinking? What if the planets did NOT align themselves just right; what then? Then a couple of interesting question must be asked. Is it realistic to expect that ALL of Oklahoma’s crop farmers are going to switch over to Industrial Hemp growth? ANSWER: Fat chance of that happening (at least not overnight), and in addition some of the crops being grown (alfalfa, etc) are being internally used for ranching purposes, so no way they’re going to switch. HOWEVER we can expect numerous acres presently classified as marginal, as well as converted ranchlands to (upon re-legalization) be placed into Hemp product. Is that three-times (3-X) profits on Hemp crops a realistic figure or just a fantasy? ANSWER: The answer is that in some cases, it is very real and in fact, a bit on the low side. So a figure of approximately $200-Million is indeed an achievable/realistic figure. Especially given Oklahoma’s favorable climate and soil conditions. Without a doubt, re-legalization will create a new multi-billion dollar industries, which in turn will bring in considerable new tax revenues into the states coffers. -- The rest of this section seeks to provide proof/info that this is the case. QUESTION: JUST HOW MUCH REVENUE, actual new tax revenues will the State Oklahoma make off of the newly created agricultural Hemp Industry? ANSWER: Realistically speaking (assuming no tax increases), between $50 and $200-Million dollars in new tax revenues; --probably toward the higher end. Which is quite a large spread and unfortunately, one that the reader will have to learn to live with. For as will soon be seen, there are multiple problems with trying to pin down an actual dollar figure. Not the least of which is that fact that Industrial Hemp cultivation is ILLEGAL in present day Oklahoma. Thus there are no free market statistics that we can reference. PROFITABILITY OF HEMP VERSUS OTHER CROPS: -- There have been some attempts to calculate the profitability of hemp versus other crops. It is not surprising that those entities that strongly favor legalization of industrial hemp production have, in general, the most favorable profit margins and multipliers effects. To which the same can be said of the opposition’s point of view. Some of the studies they’ve come out with are (well lets face it) nothing more than blatant bigoted trash. Obviously put together by those with an agenda which (again, let’s face it) is not very favorable to Industrial Hemp growth; -- irregardless of the facts. But in either case, the question still remains - Just how much tax revenue can realistically be expected to come in from Industrial Hemp growers? --- THE ANSWER, as the reader will soon see, strangely enough, does not depend upon the figures themselves, but instead upon how one manipulates them. Thus in order to answer the question fairly, it is important to first understand a little about the math and just what the figures mean. And in order to do that we first have to know a little about the subject. In other words, the technicals involved. if it quakes like a Duck. . . .then it’s a Duck. And as this one doesn’t Look Anything Like a Duck, therefore, IT’S NOT a Duck. The Marihuana plant (Cannabis Indica) grows to a height of about 4-feet, and its resin (found in the flowering tops of the plant) contains the material used to make medicines as well as for the recreational stuff. On the other hand, Industrial Hemp (Cannabis Sativa) has been known to grow more than thirty-feet in height (17-feet being more the average) and while also having flowering tops, their content is simply too weak for any recreational or medical use. However, the way our narcotics laws were written, both sub-groups are treated as being one and the same. Thus ONLY AFTER Marijuana becomes legal in Oklahoma will it be possible to once again cultivate Industrial Hemp crops in this state. 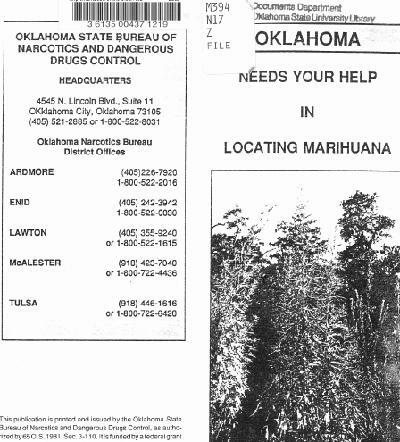 [EDITORIAL NOTE: While it is tempting to say we will legalize one but not the other, the way things work out in real life, and given Oklahoma’s OBN (Bureau of Narcotic) very vibrant history of harassment, (they’ll for sure claim that one is the other), both are simply going to have to be legalized at the same time. 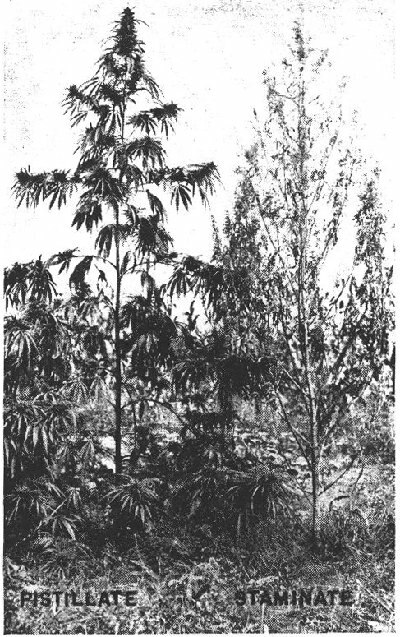 The picture (left)  shows two fully-grown hemp plants (female on the left, male on the right). Note the long thin stalk, which is important as it contains very long, very hard fibers. Fibers which in turn can be used to manufacture everything from clothes to rope to canvases to . . . a whole lot of stuff. And despite what the Levi Straus Co. says, it does appear that the first pair of blue jeans was indeed made out of Hemp cloth. But that is nether here nor there, the only point being made here is that the Industrial Hemp plant has a lot of uses. Meaning, it’s a great cash crop, which if legal, could bring Oklahoman farmers, lots and lots of extra revenues. These two images (below) give us a better look at what’s inside of the Hemp stalk. Ignoring the donut hole in the middle, there are three parts to the Hemp stalk. - The outer part of the stalk which is called the Bast fiber, is made up of very long, very hard, natural fibers. Fibers which are far superior to cotton and can be used to make rope, cloth, etc., in fact anything you can do with cotton fibers, you can do with Hemp fibers. [See Addendum-B] Which contains bits and pieces from old Sear’s mail-order catalogs, offering various Hemp products for sale. Everything from rugs to furniture and bedding materials. 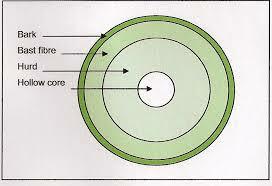 - The inner core called the Hurd, which can be used to make everything from particleboard to paper products. In fact, Europeans are using these Hurd cores to manufacture houses out of them. And so many other things that it would be all but impossible to attempt to mention them all here. Let’s just say that 95% of the plant (by weight) has its uses and that farmers are indeed make a lot of money out of it. QUESTION: How many planting (crop growths) can an Oklahoma farmer realistically expect to have each year? by October 1, 1937 The male plants had been reduced to bare stalks, retaining, however, portions of their flowering tops. On October 25, 1937, when the leaves were mostly gone and the stalks were more readily visible, it was found that the plot contained approximately 3,100 plants of which approximately 1900 were females, and approximately 1,200 were males. The FIRST KEY MILESTONE (highlighted in red) of a stalk around 7 feet long was reached in less than two months. This point is important because during the Second World War, five to eight-feet was the ultimate (given the equipment their Hemp Mills had at the time) processing length. Thus, it is technically possible (but highly improbable) to have SIX short seasons or plantings. The SECOND MILESTONE, when the stalk reaches a height of between 13 to 15 feet, was reached in a little more then just 3 months. Meaning a total of four such crop growths could technically be had per year. However, the reader should note that a two-month growth season provides the farmer with a stalk around 7-feet high, yet given an extra month almost doubles its height. Meaning twice the crop value. --- Which brings up an interesting question; -- Why would a farmer cut down his crop in only two months when she could wait yet another month and get twice as much for her crop? The answer is simply, while that might be a ludicrous thing to do in the summer, sometimes the winter months do not always agree with ones plans. That plus the time consumed in the actually seed planting, harvesting, etc., will probably reduce most farmers to no more than three-main harvests and maybe one short one per year. However, IF the crop is being grown for seed, then there is a THIRD MILESTONE which occurs roughly four-months into the planting. The point where the seeds actually become ready. --- A factor that translates into no more than 2-Seed crops and 1-stalk crop per year. HOWEVER , a hemp crop can withstand light chills and given Oklahoma’s favorable weather patterns as the table below shows, it is very likely that any given crop season here could easily straddle the calendar. And NO, the comparison states were NOT chosen at random. But instead because they were the Key Industrial Hemp Growing states during the Second World War (also known today as the “Hemp For Victory” period). But in any case, the table shows one thing – a lot more Hemp plantings are possible here in Oklahoma than in many other places. So returning to the question; --- Exactly how many planting per year? If being grown for Seed production, plantings should be made thinly spaced. This allows each plant to receive maximum sunlight, which also allows the stalk to grow to a height of about 12 to 16 feet. However, if being grown mostly for stalk, then a thicker seed planting method is to be used. Due to limited sun-light received by each plant the stalks will only grow to a height of around 5 to 8-feet, but because there are more of them, the farmer will obtain more product. QUESTION: How much of a yield can an Oklahoma farmer realistically expect to obtain from an acre of land? 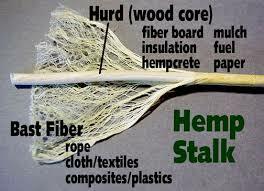 Hemp STRANDS usually refer to the long parallel strands of fiber that are obtained from the long Hemp stalks. Note these are the ones that are best for ropes, etc. Hemp TOW refers to the shorter strands that come from broken pieces of Hemp stalks. It’s the same stuff as Hemp strands, but (because they come from broken Hemp stalks) they are thus a lot shorter. The term Hemp FIBER can be used to mean either Hemp Tow or Strands. In today’s cloth industry, the two terms are used interchangeably. Please keep in mind that only between 20% to 30% of the Hemp stalk is made up of Hemp Fibers, the rest consisting (primarily) of the Hurd. The Bast Fibers make reference (yet once again) to the Hemp fibers and/or Tow fibers. Hemp Straw is the same as saying Hemp Stalks, but the term is usually used to mean, the pure stalk after it has been cut and cleaned of leafs, etc. The Hurd or the stalks inner core can best be thought of as a hard wooden stick, which can be used to make everything from particleboard to paper products. The Hurd takes up about 50% to 70% of the Hemp stalks total volume. Shivs is another word for Hurd, that is used in Europe a lot. A TON is a unit of weight and is equivalent to 2,000 pounds. Remember; the Hemp fibers constitute less than 30% of the total weight of the Hemp stalk, therefore a pound of Hemp stalks DOES NOT equate to a pound of Hemp fiber. Likewise, a pound of Hemp Seed does NOT equate to a pound of Hemp Seed Oil, etc. And here note that - (2.6 tons x 2,000 pounds = 5,200 pounds) of Hemp straw per acre per year and this was done in the middle of “Snow Bound Illinois.” One can only imagine what yearly yields we would have here in Oklahoma, given our much more favorable weather conditions to which even the Europeans are envious of. As an aside, it is interesting to note that much of the world today is very tight-lipped about exact crop yields. We can only assume that this has something to do with business/marketing reasons. However, it is interesting to note that (through oral word of mouth) modern-day farmers are reporting yields well above 3-tons and some claim that given our modern technology, that the figure of 5-tons per acre is reachable. So far we have been dealing solely with pre-existing farm lands; That is to say flat/graded acreage, presently under the cultivation of experience farmers. However, at present agricultural crop growth only accounts for about a third of Oklahoma’s agricultural lands (the rest being devoted to ranching). Thus the question; “What if marginal lands, normally not associated with crop production were devoted to Hemp farming?” Lands running up and down hillsides or grasslands with such poor soil conditions that other then weeds (no pun intended) or grasses, at present nothing can be grown there. Lands now devoted solely to raising livestock, etc. Which is a statement that is offend taken out of context. What he actually stated (in a letter to his farm manager), was something more like; “. . on the upper 10-40 acreage grow corn . . and on the lower acreage grow wheat. . . and etc.“ And then only towards the end those he write , . . and everywhere else on my farmlands, “Hemp, grow it everywhere.” Meaning grow hemp where nothing else is going to grow or could be grown anyway. Translation, the stuff is growing wild just about everywhere, meaning that it will grow just fine on (what we now consider to be) marginal soil. --- Thus growing Hemp on what is now considered marginal lands is actually a pretty good sound idea. BUT just how many new acres of land will be added? And what will their crop yields be? For obvious reasons no one at the present time knows. But there are several factors that we can look at. Sub-caption reads: Fig.6. 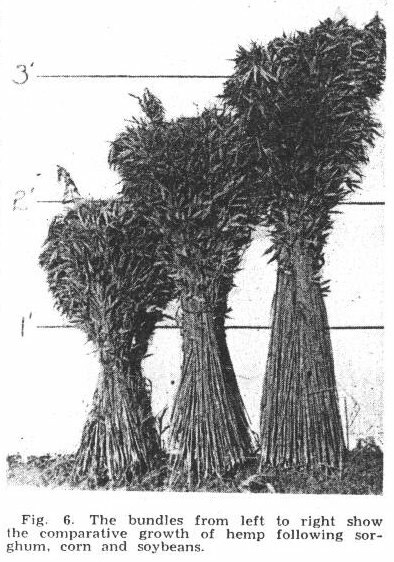 The bundles from left to right shows the comparative growth of hemp following sorghum, corn and soybeans. Thus while Hemp (in terms of the soil), is of-and-by-itself a pretty ecological friendly plant. As can be seen, it still requires and takes some nutrients out of the soil. And while established farmers could easily add Fertilizer to the soil, a rancher type would not be able to do so, so easily. -- Meaning that in all likelihood, hemp planting might be limited to one or two growth seasons per year in order to revitalized the soil. In addition it should be kept in mind, that in some cases we are talking about the sides of hilltops, etc., thus thickly grown hemp plantings are not very practical. On such soils, it will probably be more economical to grow hemp for seed value, which by definition requires a more thinly (less plants per area of land) planting. But also makes it easier for the landowner to harvest the seed, which also brings in a pretty good price. So realistically speaking we can presume that some of what is now considered, non-crop producing ranchlands will be devoted to hemp production. In addition, we must also factor in the numbers of actual/potential agricultural croplands that at the present moment are considered “Too Marginal” or “Too Small” for actual crop growth. Example: There’s a women who the author is familiar with, who lives on about 12 acres of potential cropland. However at present, she explains that with only 12 acres, it’s not practical to plant anything more than a victory garden there. However, if Hemp was re-legalized, it then becomes very practical for her to borrow a seed sowing machine, wait about 4 months (Hemp requires little maintenance) then harvest and box the seeds for sale. Her earnings (even without a lot of equipment will be well into the thousands) thus making it well worth her time. ---- Now, multiply the thousands of acres that are at present just sitting around out there doing nothing, and one can see the vast potential of new wealth coming into the state. But in terms of actual numbers, simply put, at present it is all but impossible to determine/give any accurate numbers. Those will only be figured out -- AFTER RE-LEGALIZATION, and then only a few years thereafter. And she goes on to make use of the following chart (put together by David Marcus) to make her point. Take especial note of some of the East European producers such as Hungary (JOKE; at 7 cents a pound, no wonder they call the place HUNGRY). Thus the implication being that America would have a hard time completing against foreign farmers. And the truth be told there’s no way our farmers can indeed complete on price with (again let us say) farmers in Hungary. At least not at the prices shown on the table above. And she is not alone, the Internet if full of such reports claiming (in-effect) that, even if legal, low cost third world producers will swamp American farmers out of business. However, even David Marcus’s figures are somewhat revealing in what they say/don’t say. That only between 20% to 30% of a Hemp stalks weigh/volume consists of fibers (note we use 25% in order to keep the math simple. Not bad in 1995 dollars AND this amount does not include what the farmer will also be making from the Hurd’s portion of the stalk nor seed. However, this should not diminish the treat our farmers face from low cost foreign producers. A factor which, as can be seen the following quotes (both coming from the WW-2, Hemp For Victory campaign), show, has been talked about for some time now. “It is reasonable to believe that the Japanese will follow the scorched earth policy in evacuating conquered territories, he continued, so that it will take from three to five years after the war before the hemp industry could be re-established in the Philippines and Java. Before that time American ingenuity will have established the hemp industry firmly in this country, he believes. * Our apologies if anyone is insulted by the racial slurs, that was just the way they talked back then. So the problem being addresses is nothing new, if fact it was the reason why America lost its dominance in Hemp growth in the first place. Hemp was a very Labor intensive industry, American labor was very expense and so we couldn’t complete with the much cheaper foreign imports, especially after the annexation of the Philippines. A situation that for good or for bad, now allowed tariff free imports from Filipino plantations (using Filipino workers if you get the drift), to flood our markets with cheap hemp and cordage products. However, due to our friends in Japan, those imports stopped during the Second World War and we were thus forced to grow our own again. After the war however, our other much thought of friends (the narcotics police) once more proclaimed Industrial Hemp the same as Marihuana and crushed the industry yet once again. Thus it was (literally in our case) the enemy within that brought down our post war Hemp Industries, NOT Third World Farmers. But that is neither here nor there, what is important is that Ms. Vantreese’s report (and just about all others) reached their conclusions which may/may not have been valid at the time, without taking several vital, very modern-day factors into account. First, many third world nations simply are no longer going to sell on the cheap anymore. Farm products are simply too valuable and everyone knows it. For example, the worst case offender on the table above “Hungary” is now part of the European Union and thus able to command much better prices. The same is true of other former Iron Curtain nations found on the table. Next, there is a feeling among third world nations that they can create more local jobs and earn more money, if they sell their products with as much value added as possible. Thus instead of willingly exporting raw cordage fibers, they instead wish to also do their own stalk milling, transform the raw fibers into cloth, and if possible manufacture the actual clothes themselves. It makes more money for them, keeps their workers happy, but also creates problems for countries that DON’T produce their own Home Grown. Then there is the problem of what is now being termed, “Food Insecurity.” Simply put, we are staring the Malthusian Prophecy right in the face. You might recall, he was one of those apocalyptic types who said, that one day there would be to many people on this planet and not enough farmlands to feed them, etc. Well, we’re at this point now and for good or for bad, a lot of people now feel that those third world farmers are going to have a lot more on their minds then growing cordage materials. Yet here in Oklahoma (no insults intended) much of the growth may come from lands that can’t produce much in the way of food crops anyway. As any farmer can tell you; “You don’t always reap what you saw.” Or simply put, just because one plants seed in the ground, doen’t, of-and-by-itself, guaranty a harvest. Farmers, like many others who deal in commodities, have to worry about a variety of factors. Any of which can aversely (or favorably) effect the price of what they’re growing as well as their very crop itself. And like any commodity, hemp also will respond to market, as well as natural forces, way beyond the control. However, with that said, Oklahoma (as can be seen below) seems to fair very well, and in fact is in a very favorable situation due to its claimant and weather conditions as oppose to say a farmer in snowy Wisconsin. Hemp will grow just about anywhere, but is somewhat averse to acidic or sandy soils; neither of which are a major problem here in the state. -- http://www.ogs.ou.edu/pubsscanned/EP9p16_19soil_veg_cl.pdf -- Contains a pretty good map of soil condition. Yes, we do have some areas with sandy/acidic soil conditions but in general Oklahoma is blessed with almost perfect soil conditions. Making references to the water map below: While needing moist soil (for best growth), Hemp doesn’t require nearly as much water use as many other crops presently being grown in the state. And while true, Oklahoma in the past has experience some prolong drought conditions, still in general, given our number of rivers, lakes, etc., and average weather patterns, water should not be a major concern. Simply put, if your irrigating your fields now, or providing water to your livestock, you shouldn’t have any trouble with Hemp growth. In fact, as Hemp requires way less water then (let us say) cotton, it will actually turn into a plus for the state. SOIL FERTILITY ISSUES: Although Hemp is an extremely ecologically friendly plant, requiring less of just about everything to grow, as opposed to just about every other crop out there. Still, as was seen from Fig-6, some fertilizer (unless crop rotation techniques are used), will probably be required. But the same can be said about practically any other crop being grown. And as Hemp requires less, this factor becomes an advantage, not a hindrance. The Hemp plant, while not totally immune to insects, Hemp does have the advantage of (in baby language) not tasting so good to insects. Thus giving it a sort of insect immunity not found in other crops, which in turn means that farmers do not require as much insecticides, which in turn saves them money, . . . etc. However, it should be stressed that sooner or later (Mother Nature has a way of doing this to us), some supper-duper insect will come along and cause trouble. However the same can be said for just about all other crops out there. Weather wise, Oklahoma probably sits on top of the best Hemp growing weather possible, with (assuming mild winters), year round growth possible. And obviously, if we are hit by a giant show storm (something that occurs every now and then), damage to the crop may result. However, as Hemp has the ability to withstand mild frosts, we should be able to do all-right. Oklahoma sits in one of the best geographical location imaginable. While Hemp seeds do not require much in the way of transport costs. Hemp fibers on the other hand (as a raw material) are somewhat bulky, and weigh a bit. So much so that in some cases it becomes economically unfeasible to ship them from (say) China all the way to North America. As an anonymous manufacturer stated, “the shipping costs will just eat you up.” Which is a big plus for Oklahoma as it is blessed with (very literally) being right in the middle of the United States, with plenty of rail and trucking facilities all about. In general farm machinery for Hemp production has long ago been developed and is now presently being utilized around the world. In fact (with some minor modifications) it is possible to for farmers to utilize existing machinery for all phases of the planting and harvesting. Up to this point, we have solely been looking at Agricultural/Technical factors which all point to Oklahoma having a very favorable environment for Industrial Hemp Growth. Which, in simple language, means that we’re going to make a mint. For unlike the snow bound farm areas within this country, it’s possible for Oklahoma to actually grow the Industrial Hemp plant year round. Which in turn means that our farmers can obtain much more than the 2.7-ton per acre yearly yields that our WW-II (the now named Hemp For Victory era) farmers were growing. "Hemp has always been promoted as the next big crop, but it never really took off," he said. "It was never more than a niche crop that farmers used for fiber." There’s a reason why Colonial era laws made it MANDATORY to grow Hemp. 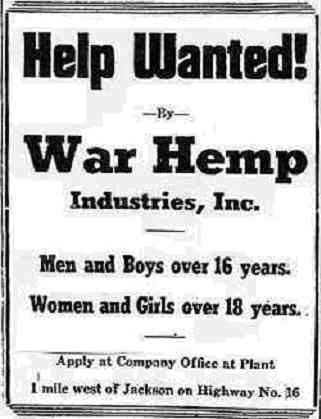 There’s a reason why Imports started to replace our own Home Grown Hemp industry AFTER the civil war. And that reason is real simple to understand; Hemp was such a backbreaking very labor-intensive industry that American farmers simply didn’t want to grow it. The story was the same here in Oklahoma free-willing labor was just too rare and costs too much. Then something wonderful happened around the turn of the 19th into the 20th century. Someone invented the tractor. Which was a good thing, for these new machines came just in time to help us out during the Second World War. Note that even kids as young as 16 were being asked to report for work. – Meaning, while there was labor there to perform, the backbreaking part had by this point been taken out of the equation. In addition, the labor needed for plowing and harvesting had by this time also been greatly reduced. Thus, the logic behind Chris’s arguments (while historically correct) is now technically flawed. But that is nether here nor there, so far what has been brought out is that from a technical standpoint, Industrial Hemp will not only grow here in Oklahoma, it will do so be doing so under almost ideal conditions. How much $$$ can a farmer “realistically” expect to receive per acre/yr of Hemp growth? Quoting an expression from the 1950’s; “that’s the forty-thousand-dollar question?” Especially as so many out there (farmers, dealers, manufacturers, governmental blocks) are going way out of their way to keep it a secrete. Even the Europeans who originally were very open about their data are becoming more and more tight-lipped of late, and not without good reason. Why tell a buyer that the last guy just before him bought at two-dollars a pound, when there’s a good chance that his going to offer of three? Knowing the laws of supply and demand, why not keep quite about an extraordinary large hemp crop for the year? Thus it appears that it’s in a lot of peoples economic interest to keep quite about exact growth and pricing data. A situation which helps them, but also means that all buyers/sellers enter into agreements blindly, not knowing what the person next to them is doing. Simply put, there’s no way of looking up today’s price of hemp on the Chicago commodities exchange, because no one is telling. A situation that makes it all but impossible to come up with any meaningful figures (via normal means), forcing us to use runaround procedures in order to obtain any kind of useful figures. Price for (the long) high quality fiber is set at around $600 to $800 euro dollars per ton. Price for (short) low quality fiber is set at around $350 to $400 euro dollars per ton. Price for Hurd is set at around $200 euro dollars per ton. Price for Hemp Seed is set at around $1,200 euro dollars per ton. Price for (the long) high quality fiber = $700 euro dollars per ton. Price for (short) low quality fiber = $375 euro dollars per ton. Price for Hurd = $200 euro dollars per ton. Price for Hemp Seed = $1,200 euro dollars per ton. WARNING: As a European report, it’s assumed that they are making reference to the “metric-ton,” which equates roughly as 2,204.6 lbs (approximately 10% more), then the American ton is only 2,000 pounds. The following figures constitute the best figures (from a 2013 European Union report) that we’ve been able to locate, and will a bit old but can still be useful in obtaining ballpark figures. --- Note that ALL calculations below will assume: 2.7-tons-per-acre/per year; --- that being the same as America’s WW-2 (Hemp for Victory) farm statistics. However, as the Europeans are (probably) making reference to the metric-ton, we have to do a bit of conversion. [NOTE --- if the reader doesn’t want to go through this, s/he can just jump down of this section and obtain the finalized answer. [(2.45 tons) x (25%) = 0.613 tons] of (both short/long) fiber. ($322 euro dollars) + ($57 euro dollars) = $379 euro dollars per acre per yr. The above figures were ALL calculated using 2013 figures. The price of the Euro has dropped quite a bit since than against the dollar. The European Union gives out Farm Subsidies for agricultural production (including Hemp farming). But then we do the same for our farmers over here. No mention of Hemp Seed growth was made in the above example. However, it is our understanding that the profits (per acre per year) would have been much higher as Hemp Seed is at the present time commanding a premium WAY NORTH of Hemp stalks grown primarily for fiber. But despite the Warning above, the math seems to show that the optimistic predictions are about right. ADDITIONALLY, the math (as shown above) ignores several key factors that will add even more value to what Oklahoma farmers will earn per acre. First, the above calculations were done using a figure of 2.7 tons (per acre/per year), which comes from old 1944 (Second World War) Hemp-For-Victory era statistics from the state of Illinois. A snow bound state with maybe two good crop seasons per year. Here in Oklahoma due to Oklahoma’s more favorable weather, it’s possible to have more plantings. Next, we were using “Low Ball” percentage figures to calculate earnings from Hemp Hurd as well as fibers. To obtain more probable economic figures, one would need to add at least an additional 5 to 15 percent more to the above calculations. The above calculations totally ignores any kind of Hemp seed harvest. A factor which of and by itself could prove much more profitable then Hemp’s growth solely for its stacks. Then it must be noted that yesterdays “Hemp for Victory” farmers were for the most part, not very well experienced with Hemp growth. Any farmer can tell you that it takes a while to get the hang of the thing. The same goes for the equipment which those farmers were using. With today’s equipment, it might be possible to drastically increase the tonnage per acre produced. Last of all, (some are saying that) with today’s modern farming techniques, it is now possible to grow as much as 5-tons of Hemp stalk per acre (per year), but 3.5 to 4 tons sounds more realistic. According to the optimistic viewpoint, farmers will rack in well over $876 (in 2013 US dollars) per acre. A figure that seems to be supported by the latest (meaning 2013) open statistics available. And due to the various reasons already stated, the figure calculated should be seen as extremely “Low-Ball” starting figures. When this report was first being put together, there was ever the intention of being fair-minded. No matter how pro-Industrial Hemp the compilers of this report were, it is important not to look at things through the rose colored glasses of wishful thinking. . But, instead to hear both sides of the issue and report their opinions as openly and objectively as possible. We would have been doing everyone a disservice had we not done so. Thus, our original intention was to simply compile a listing of the “pessimistic” viewpoints or concerns and presenting them in a reasonable and fair manner. To use their own math and work out (as closely as possible) their financial findings, the idea was to be fair to all viewpoints. Here we wanted to remain politically neutral and thus did not feel it appropriate to continue with the immediate subject matter as part of this report. Here, all that we can or should say, is that yes, the pessimistic viewpoint is out there. And that yes, they too have written up financial reports of their own on the subject with their own math. However, we (being very fair and impartial) were not able to confirm their figures or math. And maybe that’s enough said on the subject. Obviously (see sec 6.9.2), this report has been forced to deviate widely from its originally intended purpose. That being to obtain actual real world financial numbers that we could use to determine what financial impact re-legalization would have on our states general revenues. And as re-legalization would open the way for Industrial Hemp growth in Oklahoma, to examine/determine just how much in new state revenues it would create. However, as with any commodity, especially one for which due to a myriad of issues, we have not been able to obtain any recent/specific data for. But be that as it may, and “necessity being the mother of invention”, we originally thought to obtain at least a ball-park figure by obtaining a Maximum figure (sec 6.9.1) and then a minimum figure (sec 6.9.2), which would at least give us a couple of starting points. Then “hopefully” with some deviation-al math, allow us to come up with a realistic in-between figure we could plug in and thus obtain a ballpark figure. While the Maximum figures, hinted at by the supporters of re-legalization made some sense, and were at least supported by actual financial facts. The Minimum figures were put together . . . (maybe it’s best not to go into that area, if the reader is interested, s/he can look over Addendum-C). For our part here, let’s just say that no independent accountant type would except them. These calculations give us a total of $783 dollars per acre, which (in Oklahoma’s case) as we can grow year round most of the time, and as our calculations were based on older (much lower) 2.7-tons per year growths. This literally means that we must view the stated figure as only being a low/starting point. If we can grow three crop seasons instead of just two, all the above calculations would have to center around 4 tons per year, maybe more. Or we could have made use of figures given to us by Colorado farmers who are actually/presently growing Industrial Hemp and who claim that tbd figures. Or . . . and the OR’s can continue on and on. The point being made here is that while, we were forced to make use of the optimistic figures, as all the pessimistic ones are . . . (ah, how shall we put it), so laughable as to be unusable. However, the reader should note, that we’ve made use of lower end of those optimistic figures available. It we really wanted to go wild, we could have plugged in the more realistic figure of 3 to 5 tons per acre (as oppose to only 2.7), etc. Thus for the rest of this report, we will simply make use of the Ball-Park figure (wart’s and all) $783 dollars per acre/yr. Now that we’ve obtain at least a “Ball-Park” figure of $783 per acre/yr. We now need to know just how many acres of Oklahoma agricultural land is going to be involved in Hemp Production? And to even take a guess-timent first requires us to look at three different kinds of very different acreage. According to state statistics  Oklahoma has some 68,595 square miles of actual dry land, (as oppose to land underneath a lake or river, etc). Of which 34,2000,000 acres consists of established agricultural lands. However, it appears that only about a third of that is actually established crop lands (the other two-thirds being ranch lands), and that one third also includes fruit orchards, etc., or things not normally associated with actual crop growth such as wheat, or rye, etc. And (carrying on with our fantasy), if ALL farmers (remembering that crop growth is already a $2-Billion dollar a year industry), were to pay just 5% state taxes on their profits of $6-Billon, would mean an extra $300-Million in additional state revenues. Presently ALL our Oklahoma croplands (all of them put together) account for no more than $2-Billion dollars in agricultural sales. Thus any figure that increases that amount automatically causes an increase in earned tax revenues, which in turn leads to more tax monies for our state coffers --- WITHOUT AN INCREASE IN TAXES. And Industrial Hemp (sec. 6.9) will increase that amount by a lot . . . quite a pretty penny. At present Oklahoma has two acres of agricultural land devoted to ranching for every one acre of cropland. This is due to a number of (we presume) mostly economical factors. Sometimes, maybe, ranching just brings in more money (acre per acre) than crop growth. But it is safe to presume that one of the main reasons for this being is that some acreage, while ok for growing grasses and weeds (no pun intended) simply ain’t good enough for actual crop production. Here are also talking about lands that are running up the side of hills, or isolated patches where it just isn’t practical to bring in a tractor, etc. BUT, what if a crop like Industrial Hemp, which is not a high maintenance plant, were allowed. If grown for seed, all that is really required is for someone to simply plant the seed (which can be done with a lawn mover size device), and come back some 3-4 mounts later with some boxes to load the seeds into. That’s it. Hemp needs little if any pesticides and of-and-by itself is a herbicide. Simply put, it’s the perfect low-maintenance crop that ranchers have been looking for, for a long time. Thus for our purposes here, we will not only not know exactly how many new acres of former ranch lands will be switch over to Hemp production, but also have no way of knowing exactly what sort of harvest we can expect per acre. These constitute those Farmlands that, while on paper are “technically” classified as agricultural are in effect laying fallow with no present agricultural uses. Croplands that at the present moment are considered “Too Marginal” or “Too Small” for actual crop growth. There’s a woman who the author is familiar with, who lives on about 12 acres of potential cropland. However at present, she explains that with only 12 acres, it’s simply not economically practical to plant anything more than a victory garden there. However, if Hemp was re-legalized, it then becomes very practical for her to borrow a seed sower. Wait about 4 months (Hemp requires little maintenance) then harvest and box the seed crop for sale. Her earnings (even without a lot of equipment will be well into the thousands) thus making it well worth her time. ---- Now, multiply the thousands of acres that are at present just sitting around out there doing nothing, and one can see the vast potential of new wealth coming into the state. And here it should be noted that this “too small to plant anything factor,” is quite a common occurrence here in this state, where (what used to be) large farms have been so subdivided. That the farms (if they can still be call that) at the present time appear more like postage stamps then actual farms. Then there is the too Marginal factor that cannot be ignored. Some state lands, simply are that, too marginal to practically be put into full time crop production. However, Hemp being a pretty hardy/low maintenance crop might (at least for one planting season per year) be grown on such lands. Our problem here however is that there is no actual way of determining exactly how many of these acres are going to come on line once re-legalization is established. In addition, there is no way of knowing exactly how productive, nor how many planting seasons per year they will have. However, some simple math indicates the shear financial numbers that we are talking about. If just one square mile per county is now put into Hemp product; Just one square mile per county. And assuming a tax rate of just 5%, that would equate to $2.2-Million dollars in additional tax revenues. But again, we don’t know how much fallow land will be put into production. A factor that explains why we must add a (PLUS) at the end of any actual figures calculated. In addition it should be kept in mind, that in some cases we are talking about the sides of hilltops, etc., thus thickly grown hemp plantings are not very practical. On such soils, it will probably be more economical to grow hemp for seed value, which by definition requires a more thinly (less plants per area of land) planting. But also makes it easier for the landowner to harvest the seed, which also brings in a pretty good price. But once more, the exact numbers, both of acres and actual production tonnage per acre will not be known until well after re-legalization. Were it not for present day legal issues involved, this would be an easy figure to calculate. Simply put, we would have determined the number of acreage involved, tabulate harvest numbers. Obtained an exact/about crop tonnage number and after looking up the current commodities price of Hemp, calculated a figure. However, we don’t know and have no way of determining the exact numbers of acreage that will be put into production. Nor do we have any way of tabulating exact harvesting numbers. Thus making any actual attempt to obtain exact figures all but meaningless. However, we were able to obtain some facts. That could point us in the right direction. We know that in 2013 (the latest open data available) on the subject, that European Union Hemp farmers were making more then $887 dollars per acre from their stalk productions. We do not have any data on what the Hemp seed farmers were making, but it was considerable higher. A figure that is probable on the low side as we are using a total growth tonnage of only 2.7-tons per acre. We know that during the Second World War inexperience farmers who had never grown the crop before were growing an average 2.7-tons per acre. We believe that in today’s world the average (assuming stalk production) will be around 3-to-5 tons per acre, and some claim more. We know that (weather-wise) Oklahoma has about as near prefect a climate as it comes, and thus unlike snow bound states, year round hemp crop growth is possible. We know that many acres of presently fallow/unused farmlands will be brought into crop production. Economic factors that let us play games with some of the math. For instance if ALL the Winter Wheat acreage were switch over and grow only Industrial Hemp, a figure of between $4-Billion to $6-Billion dollars would result. Which in turn will result in new tax revenues to the state of between $100-Million to $300-Million dollars. However, any way one plays with the math, it is obvious that the potential for a new multi-billion dollar industry is there. One which due to it’s profit margins can be realistically expected (of and by itself) to generate lots and lots of new tax revenues.